It has been a while since I have posted here, but I have been busy! I've enjoyed a trip to Broome with a friend, written the first draft of a children's novel, finished a writing course at Writers Victoria, edited a few bits and pieces, including the third issue of BIG Kids Magazine, and I have started an online art course this week! 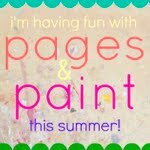 The art course is called Pages and Paint, taught by Sarah Ahearn Bellemare, and organised through Squam. I am only three days in, but already I have organised my studio space in my study, started my sketchbook and added to my inspiration wall. I am really enjoying all of Sarah's videos and guidance, as well as all the interaction from the other participants. It feels as though my kids are doing the course alongside me. Every morning, they watch the videos with me, create in my study/studio and are working on their moon sketchbooks (more about that later). A photo of my new art space ... in a corner of the study. Your space looks fabulous Karen, I know you will be inspired to produce some spectacular work! What a lovely space. Looks like a real artist's corner. And I love the little desks you've set up alongside yours. Have a great time creating!